DANCE MASSIVE, IN ITS SECOND INCARNATION, AGAIN PROVED TO BE INVALUABLE TO THE GOOD HEALTH OF AUSTRALIAN CONTEMPORARY DANCE, ATTRACTING PASSIONATE AUDIENCES, STRENGTHENING A SENSE OF COMMUNITY AND GENERATING INTENSE DISCUSSION ABOUT THE STATE OF THE ARTFORM AT A TIME WHEN HYBRIDITY RULES. This unique dance event premieres new works, re-mounts acclaimed productions and invites local and international presenters to consider prospective touring and co-production. This is a dance event that is both marketplace (showing complete works rather than excerpts) and festival. The value for dance artists of seeing and discussing each other’s work cannot be underestimated. 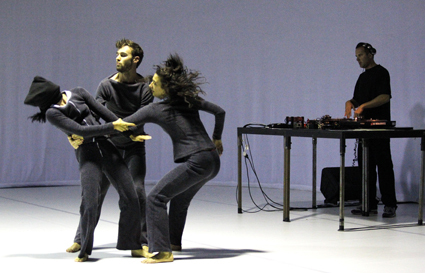 Dance Massive has also commissioned RealTime in 2009 and 2011 to provide detailed responses to all the works in its programs, with some creations being reviewed by two writers or covered again in survey essays, for example on space or sound (p20). As newspaper reviewing declines, as evidenced in shorter and shorter responses, if offered at all, it’s important to have longer estimations of choreographers’ creations, both as documentation and dialogue. RealTime Editors Virginia Baxter and Keith Gallasch teamed with Melbourne writers Jana Perkovic and Carl Nilsson-Polias to respond to the performances while Associate Editor Gail Priest put our words in print and online and produced the RealTime video interviews with Dance Massive artists. Significantly these interviews were made soon after we’d seen the work—unlike most media interviews that act as previews of works as yet unseen. We look forward to doing many more of these. It’s of concern that the future of Dance Massive seems uncertain, not least because its cooperative progenitors—Stephen Richardson (Artshouse), Stephen Armstrong (Malthouse) and David Tyndall (Dancehouse)—are all moving on. As Richardson points out in the interview with Sophie Travers (RT101, p36) staging Dance Massive has involved a considerable programming investment from its partners. Dance Massive might not be sustainable for the partners in the future nor match the visions of their incoming directors. Another key event is the Sydney Opera House’s Spring Dance season—its propagator, Wendy Martin, is also on the move. Australian contemporary dance has long needed a celebratory and analytical focal point, once provided by the Greenmill festivals (1993-97) in Melbourne and intermittently since by Australia’s international arts festivals. The loss of Dance Massive would surrender the opportunity for greater public awareness of dance, vital communication between artists across the country and opportunities for presenters to program innovative dance creations of the highest quality. A selection of our Dance Massive reviews follows—others can be read on our website where you’ll also find video interviews with dancemakers.